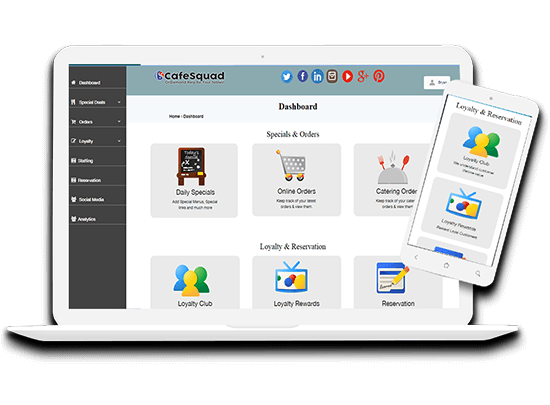 CafeSquad manager's dashboard and mobile app are powerfully integrated. The beauty of this dashboard and mobile app is that you can do instant promotion of your coupons, happy hours, daily specials and events. You can look at your reservations, you can see your loyalty club members and you can send them specials in messages. You can do fax broadcasting, you can check at your social media ranking in traffic and we can see all kind of activities that are required for your digital presence.Dashboard is restaurant local marketing platform complementing web design and marketing solutions for restaurants.